Marvel’s Agents of SHIELD brings the action back to the present day and wastes no time setting the team on the task of preventing the end of the world. After 10 episodes in a Post-Apocalyptic future setting it’s refreshing to return to more familiar surroundings. As good as the Lighthouse arc was a dark and claustrophobic setting wears out its welcome eventually. The characters seem to enjoy being back in their own time as we see from the happy reactions to experiencing fresh air for the first time in a while. 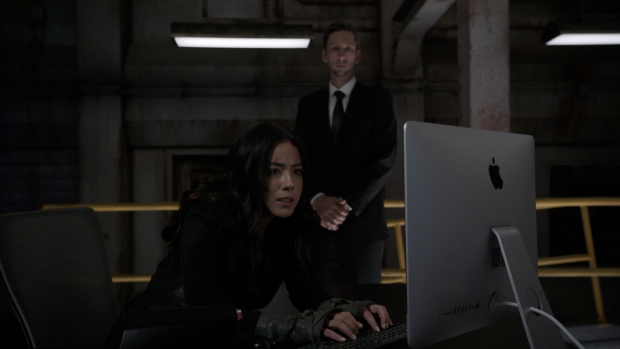 In true Marvel’s Agents of SHIELD fashion there is no time to smell the roses because the team find themselves thrust right into another situation connected to the looming Apocalypse. The episode throws a lot of information at the team and the viewer right off the bat. They are welcomed to the Lighthouse by a recording of Rick Stoner (Patrick Warburton) who explains that it was built as a shelter for important people in the event of a world ending scenario. It was something started in the 1970s but abandoned and forgotten to the extent that Nick Fury didn’t even know about it. This makes it the perfect hideout for the team at this point as there is limited risk of being found out. The Rick Stoner scene is really funny in its execution with different projectors placing him at different parts of the base so he can take the occupants on a tour without being there. It’s a charmingly retro version of the 3D holograms this show often uses and a reminder that S.H.I.E.L.D. was always very much on the cutting edge of technology. Ultimately it’s little more than table setting and the episode treats it as such without letting the information get in the way of moving the plot forward. As Stoner is talking everyone else is getting their bearings and figuring out their next move. Shortly after we are introduced to Noah (Joel David Moore); another Chronicom using the Lighthouse as an observation post. His function in the episode is minimal which makes sense as he is tasked with observation rather than interference but he has set up equipment that allows the team to monitor problems that they will have to deal with. It’s a neat way to keep the plot moving without wasting time putting these things in place. Noah is entertaining enough as characters go and bounces off the others fairly well though if his last scene is anything to go by it seems like this is the last time we’ll see him. It’s probably for the best because there may not be an awful lot for him to do after this episode since the team are pretty well set up with everything they need after this. I did appreciate that the writers stuck to their guns with the Chronicom non interference directive. Noah is able to point the team in the right direction but won’t actively get involved. This becomes a source of frustration for Daisy later in the episode and further cements Enoch as being an exception. If every Chronicom encountered abandoned the non interference directive then the idea would become a joke so remaining consistent with that is definitely a good thing. The world the team have returned to has a lot of issues that affect them personally. They have been bumped to the top of all Most Wanted lists meaning that general movement is going to be very difficult. This adds a layer of tension to them moving around a small town as there’s a strong chance they might be discovered at any moment. Borrowing a van without asking only makes things more risky as if it’s reported stolen it attracts a lot of attention. The scene where they are stopped by the police who simply want to have a friendly conversation is really well done with the classic misdirect associated with the small town police having no idea who they are. It addresses the fact that everyone in a small town will know each other adding extra risk borrowing the van since their cover can so easily be blown by a casual conversation. It takes a lot of skill to fill a friendly conversation with so much trepidation. This scene pays off later thanks to Mac assuming that the cop is talking about his obvious injuries. When Daisy shows up at the police station later sporting similar injuries there’s an immediate suspicion from him because it would be unusual to see this twice in the same day in a small town. Granted this is basically used to fuel a red herring but it’s effectively done and shows competence from a very minor character. 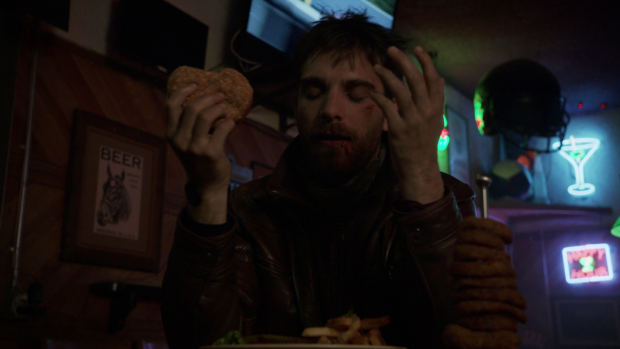 Deke’s “death” in the previous episode is casually undone by him turning up in the present day shortly after the others do. I wouldn’t say this undercuts his sacrifice in any was as his selfless moment still has validity to it since he thought he was going to die. Deke in the present day does have a lot of potential that is worth ensuring that he doesn’t die in the Post-Apocalyptic future and this episode makes good use of it. First thing is that he’s amazed by everything he sees which makes sense considering he has never seen the sky, experienced fresh air or tasted food that doesn’t immediately sterilise him. His appearance is used to give the episode some levity as he explores the simple pleasures of a pub lunch along with several alcoholic drinks before being arrested for not being able to pay. This presents an issue as Daisy assumes he might accidentally talk about them therefore compromising them so she heads out to retrieve him under the guise of a social worker. It’s a fun subplot that feeds into the larger issue of the team having to watch every move they make or risk discovery. The simple act of Daisy trying to convince the small town police to let Deke go is played as if it’s a very risky venture with Daisy almost losing control of the situation at various points. There is the potential for this to become problematic in the coming episodes as Daisy had to leave a number for them to follow up. The main plot of the episode involves a signal being sent into space calling the Kree. 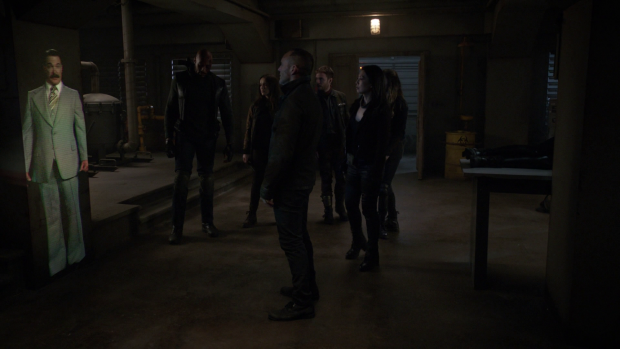 Coulson recognises this as the same thing Voss warned him about so mobilises the team to go track it down and stop it. Preventing the destruction of Earth is the overall purpose of this part of the season so it makes sense that the first episode in the present would feature the first omen of this happening. It seems like a fairly simple mission all told and the team even reunite with Agent Piper (Briana Venskus) who fills them in on what has been happening since their disappearance before promptly betraying them once the device is disabled. Her reasons for doing this are somewhat understandable as she was put in a difficult position and had no real choice when the US Military caught up with her. Ultimately she proves her true loyalty and offers to cover Coulson and his team but there must still be an element of distrust after this. The only real misstep the episode makes is assuming that the audience will have a connection with Agent Piper that makes her betrayal a surprise. 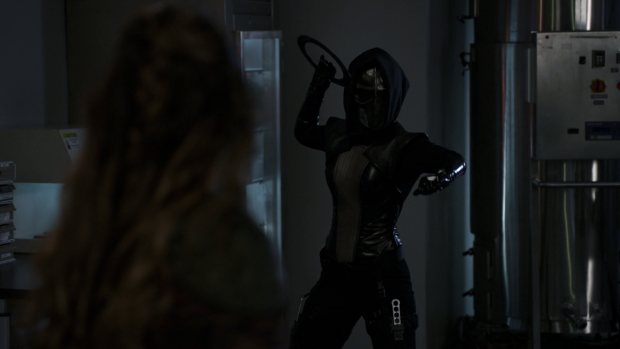 She was a very minor character in season 3 and vaguely defined when she appeared there so the shock reveal of her betrayal lacks the impact due to lack of investment in the character. This encounter is filled with comic book craziness in a good way. A squad of robots led by a mysterious masked figure armed with razor sharp Tron disks shows up and a Mexican stand-off ensues resulting in the amputation of both of Elena’s arms. It’s a really grizzly and shocking scene that all but confirms my prediction of the episodes being filled with attempts to change the future countered by examples that suggest they can’t. The future version of Elena didn’t have her arms and this episode answers why that is though it’s clear that she will have some kind of prosthetic fitted based on the flashback episode showing her limbs to be intact. Coulson has a replacement hand so therefore it’s possible for Elena to have replacement arms. Putting that aside the moment is appropriately shocking as well as being a very clear indicator that the characters are simply playing their part in something that has already happened and will continue to happen over and over again. A sense of morbidity creeps into the episode through this and Elena will be most of all affected by this as she is already suspicious of Coulson so this example of the future playing out in front of her may all but confirm what she sees as inevitable. This episode introduces a new character in the form of Ruby (Dove Cameron) who initially seems to be a sassy smartphone obsessed teen with a lack of respect for her Mother, General Hale. She essentially bookends the episode with the latter scene adding further weight to the former. Initially it seems like she disagrees with her Mother over how the Government should approach dealing with the S.H.I.E.L.D. team. She has a poster of Quake on her wall and regards her as a Hero so clearly differs from her Mother on that opinion. There is mention of missing class which suggests she’s like any other petulant teenage character and there’s a sense that she rejects the military style discipline forced on her by General Hale. In other words it seems like nothing that hasn’t been done pretty much everywhere else and therefore not very interesting. Ruby’s latter appearance revealing that she is the mysterious Tron Disk wielding masked figure adds further intrigue to that. Suddenly “class” takes on a much darker meaning with the implication that some form of brainwashing is at play. Quake may be her hero but that doesn’t seem to apply to the others as she had no problem attacking them. Then again it’s not even clear if she was in full control of her actions at that point so there’s a lot to play with here. Another question raised is if she is General Hale’s biological daughter or perhaps an alien/Inhuman who believes that she’s a Teenager. I can see this relationship being a large part of the remainder of the season and I’m very intrigued by what I’ve seen so far. 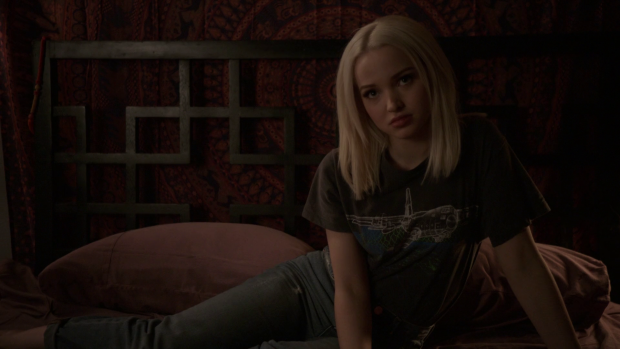 Dove Cameron’s performance nails the impetuous teenage side and cold government operative side so this is definitely a strong start. Next week brings us the 100th episode of Marvel’s Agents of SHIELD with the possible plot of this being teased in this one. General Hale recruits Carl “Crusher” Creel into a team that she’s putting together to be used against S.H.I.E.L.D. in some way. This doesn’t tell us much but it’s good to have Creel back as he has been used well in the past and I like the idea of celebrating 100 episodes by having Coulson and his team deal with a group of surviving past antagonists. It’s certainly a milestone and I look forward to seeing how this show celebrates it. An excellent episode that deals with the return to the present day really well. It wastes no time in setting up the situation and getting the plot moving without forgetting to focus on the characters. Deke’s surprise appearance brings a much needed dose of levity to the episode as he has fun trying out things he never dreamed that he would experience. His arrest adds to the overall tension because Daisy has to risk being recognised in order to retrieve him. The mission to deal with the beacon is handled well though Agent Piper’s betrayal doesn’t work because there hasn’t been enough opportunity to develop the character in a way to give the reveal the desired shock value. Elena’s arms being cut off was a genuine shock and offers a grizzly reminder that their efforts to change the future may prove futile. The introduction of Ruby is well handled with her second scene adding weight to the first. Her first scene establishes her as a spoiled smartphone obsessed teenager with no respect for her Mother who parents her with Military techniques. It seems dull and contrived on first glance but the later scene revealing her to be the masked figure throws up so much intrigue and asks lots of questions as to her true identity and purpose. It’s certainly a compelling character introduction with lots of room for exploration. Next week brings us the 100th episode and I look forward to seeing how this milestone is celebrated.